I just found an interesting piece on Internet censorship at arXiv, my favorite go-to place for scientific papers that are pre-publication. 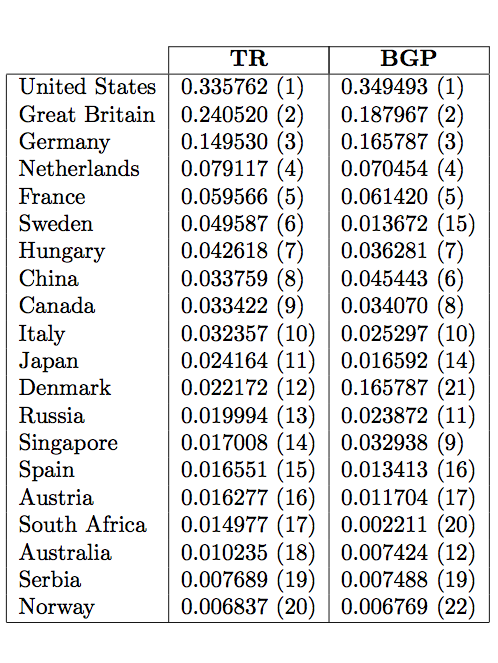 Entitled “Nation-State Routing: Censorship, Wiretapping and BGP,” this empirical study is possibly the first to determine the aggregate effect of national policies on the flow of international traffic. As government control over the treatment of Internet traffic becomes more common, many people will want to understand how international reachability depends on individual countries and to adopt strategies either for enhancing or weakening the dependence on some countries. The scope and magnitude of this affect is unclear. What we do know is that one may intentionally or by accident apply censorship policies to international traffic, as demonstrated by the global YouTube outage last year as a result of a domestic Pakistani policy directive. The authors therefore developed a framework to study interdomain routing at the nation-state level. 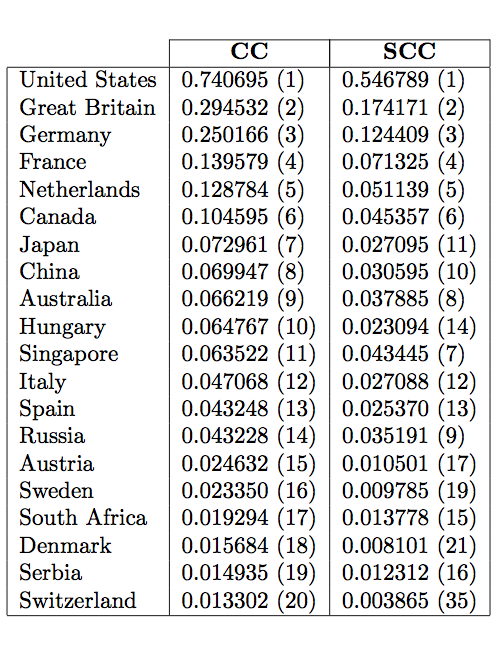 They first adapted the “Betweeness Centrality” metric from statistical physics to measure the importance, or centrality, of each country to Internet reachability. Second, they designed, implemented and validated a Country Path Algorithm (CPA) to infer country-paths from a pair of source and destination IP addresses. The table below shows Country Centrality (CC) computed directly from Trace Route (TR) and Border Gate Protocol (BGP). The closer the number is to one, the more impact that country’s domestic Internet censorship policies has on international Internet traffic. 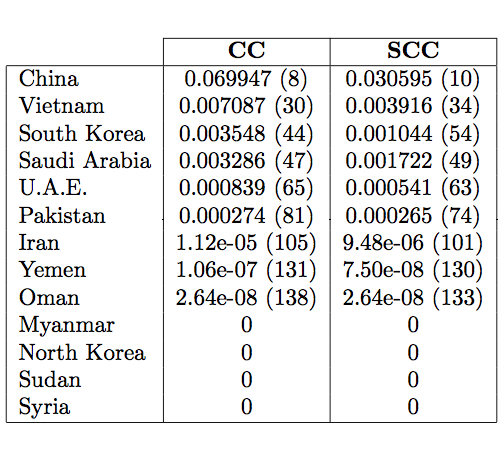 The second table below lists both Country Centrality (CC) and Strong Country Centrality (SCC). The latter measures how central countries are when alternative routes are considered. When SCC equals one, this suggests a country is completely unavoidable. The authors of the study point to a number of interesting questions for future research. For example, it would be interesting to know how the centrality result above change over time, i.e., which countries are becoming more central over time, and why? Another important question is what economically driven strategies single countries (or small coalitions of countries) could adopt to increase their own centrality or to reduce that of other countries? This entry was posted in Digital Activism and tagged Censorship, Digital Activism, digital democracy, repressive regimes. Bookmark the permalink.